The Utica Region in eastern Ohio, one of the fastest growing natural gas production areas in the United States, has been added to the Drilling Productivity Report (DPR). 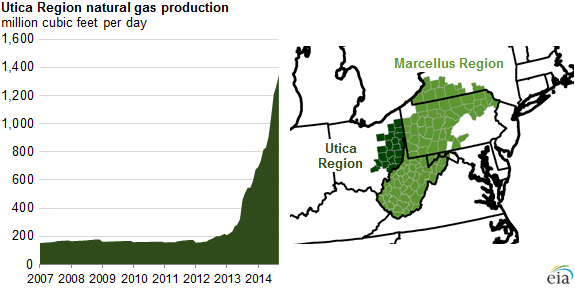 Total natural gas production in the Utica Region, which includes production from the Utica and Point Pleasant formations as well as legacy production from conventional reservoirs, has increased from 155 million cubic feet per day (MMcf/d) in January 2012 to an estimated 1.3 billion cubic feet per day (Bcf/d) in September 2014. Utica formation drilling activity has been primarily focused in eastern Ohio since mid-2012, although the geologic formation extends into Maryland, New York, Pennsylvania, and West Virginia. Some producers are successfully targeting the Utica formation in northern West Virginia, but these wells fall within the existing DPR Marcellus Region. The DPR analyzes all drilling and production within geographic areas in order to capture total production volumes supplied to the market and is not limited to the formation name used for the region. Production growth in the Utica Region is a function of both increased drilling productivity (measured as production per rig) and increased drilling activity (measured as number of rigs). Drilling productivity, or the average monthly production from new wells per drilling rig, has increased from 0.3 MMcf/d in January 2012 to an estimated 5.0 MMcf/d in August 2014. This increase has outpaced the growth rate seen in both the Haynesville Region from 2009 to 2011 and the Marcellus Region from 2010 to 2012, although current levels of drilling productivity in those areas still exceed that of the Utica Region. Compared to these changes in productivity, increases in drilling activity have been relatively modest: while there were fewer than 10 rigs drilling in the Utica Region prior to 2012, drilling activity has stabilized at between 20 and 25 rigs since early 2013. Note: Production growth indexed from January of the year production began increasing rapidly in the region. The pace of drilling productivity growth can be attributed to both the geological properties of the Utica formation—it contains significant volumes of oil and natural gas—as well as the considerable horizontal drilling and hydraulic fracturing expertise producers are bringing to the play after nearly 10 years of drilling shale and tight formations. 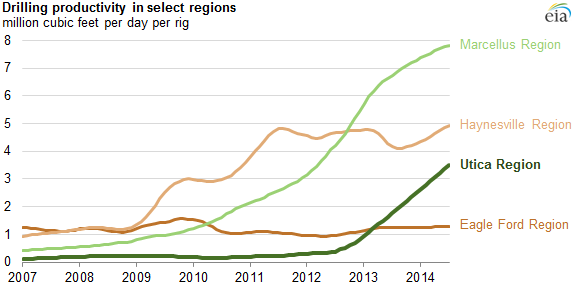 Because of the relatively low number of rigs drilling in the Utica Region, total natural gas production has grown about on pace with production growth in Texas's Eagle Ford Region from 2010 to 2012. The chart above indexes production growth from January of the year natural gas production in the region started increasing rapidly, in order to compare the pace of production growth across various regions. 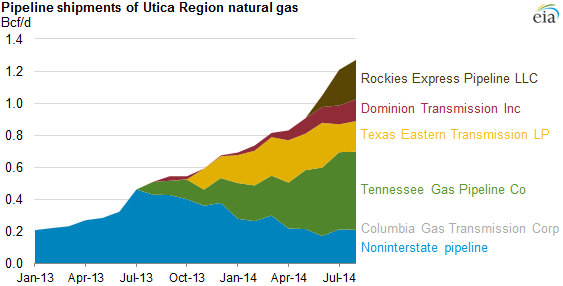 Utica Region natural gas production growth was constrained before July 2013 because of limited natural gas processing capacity in the area. As a number of processing plants have been built and brought into service over the past year, more natural gas is being gathered from wells and processed to meet pipeline specifications, allowing the gas to flow on interstate pipelines. In late June, the Rockies Express Pipeline (REX) began transporting Utica Region natural gas westbound from eastern Ohio. The REX system started transporting natural gas in late 2009 from Colorado and Wyoming to the Midwest, but significant production growth in Ohio and Pennsylvania has prompted the addition of capability for some westbound flows on portions of Zone 3. These additions allow pipeline operators bidirectional capability (with capacity for westbound as well as eastbound flows), in order to take advantage of low-cost supplies from the Utica Region at the eastern end of the system. By mid-July, Zone 3 had reached its initial capacity of receiving 0.25 Bcf/d from eastern Ohio; the company has plans to expand the bidirectional flow to 1.80 Bcf/d by mid-2015, and potentially up to 2.35 Bcf/d by the end of 2016.